A home with sea views was always on the horizon for Matt Wadewitz and Sarah Moore. The married couple bought a block of land near the sea a number of years ago and the plan was eventually to knock down the existing building and rebuild at some stage. "The block we bought had an old run-down transportable home on it," Matt says. "We had been renting it out for most of the time we owned the home when, eventually, it got to a stage when it was going to cost a fair bit of money to keep it up to scratch. That's when we decided the time was right to bulldoze it and build the family home." 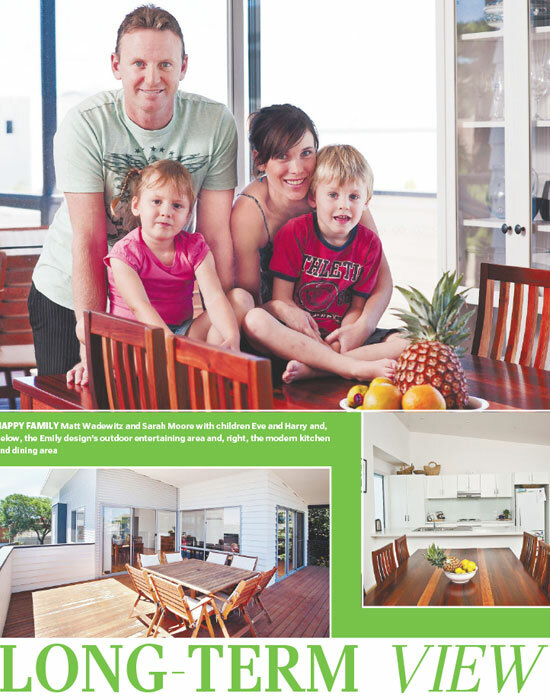 The couple, along with their two children, Harry 4, and Eve, 3, chose the two-storey Emily by Sarah Homes. "With lovely sea views, we recently wanted to exploit that aspect," Matt says. "A large deck on the second level is a great place to look over the water and this has lots of space to entertain people out there as well. We spend most of our time on the deck in the warmer months. "A skillion roof also opened up the available views for us. From inside the home you can also enjoy the views through the large glass windows and sliding doors." A galley kitchen, overlooking this open space, includes overhead cupboards for extra storage, breakfast bar, Essa Stone benchtops, stainless-steel oven, cooktop and rangehood and a large frosted-glass window to allow in natural light while still providing privacy. The main bedroom, which has a built-in wardrobe and ensuite, is behind the kitchen. A powder room with a separate vanity is nearby, allowing visitors to wash up for dinner. The ground floor includes three bedrooms which open on to the central living area. "I think as the children get older they will be spending more of their time downstairs while the adults live and entertain upstairs," Matt says. "That's a few years off but is something we thought about when we chose the design." A three-way bathroom is also downstairs, near a staircase that includes handy understair storage. The laundry, which has outdoor access, is on the other side of the staircase.